Cruise through the azure waters of Turkey’s coastline on a gulet, a luxurious wooden sailing vessel, and experience the height of luxury. Turkey is blessed with 8,000m of stunning coastline to explore, and one of the most enjoyable ways to discover its secrets is on a traditional gulet yacht designed especially for tourist charters. One specialist company is Turkey Luxury Gulets. They have a selection of amazing fuel-powered boats of various lengths up to 56m that come with two or three masts. On board is a crew of up to seven people including a chef who cooks fresh food sourced locally to suit every day. 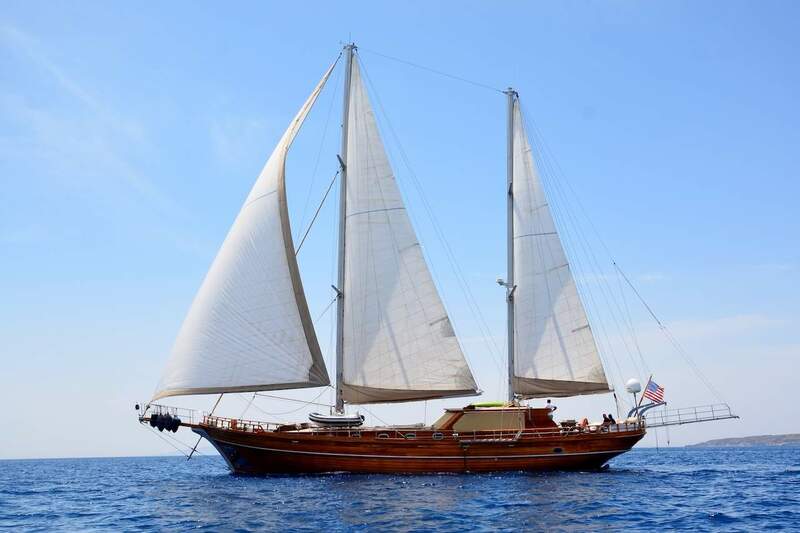 Gulet holidays are ideal for 3-12 guests and so suitable for a family holidays or for groups of friends. There’s plenty of entertainment on board for both adults and kids and plenty of water sport equipment. Here, we pick our three favourite gulet cruise routes in Turkey to get you inspired, which can all be booked through Turkey Luxury Gulets. You first board your gulet in the ancient coastal city of Bodrum in the southwest Aegean region. The city was once home to the Mausoleum of Mausolus, one of the Seven Wonders of the Ancient World. Sadly an earthquake destroyed the mausoleum centuries ago, but the city still contains many examples of ancient heritage including Bodrum Castle, which was built in the 15th century. From here you sail to Orak Island, where you can go swimming in the warm, crystal clear waters of the Aegean Sea. Or go jet skiing, paddle boarding and water skiing. Next you will travel to the Seven Islands of the Gökova bay, which contain some beautiful coral reefs. Your gulet has snorkelling equipment so you can get up close and personal with nature. 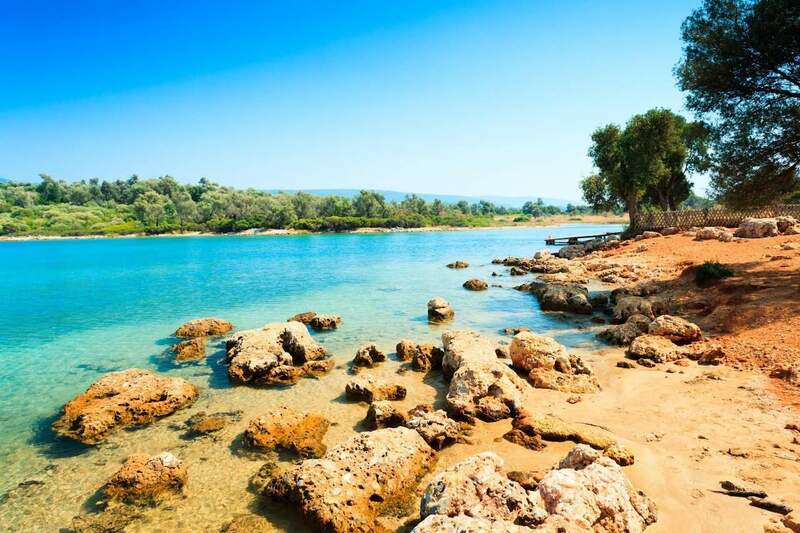 Highlights include a stop at Kufre Bay, which is surrounded by fragrant pine forests, and Sedir Island (also known as Cleopatra Island) famous for its beach made of seashells. 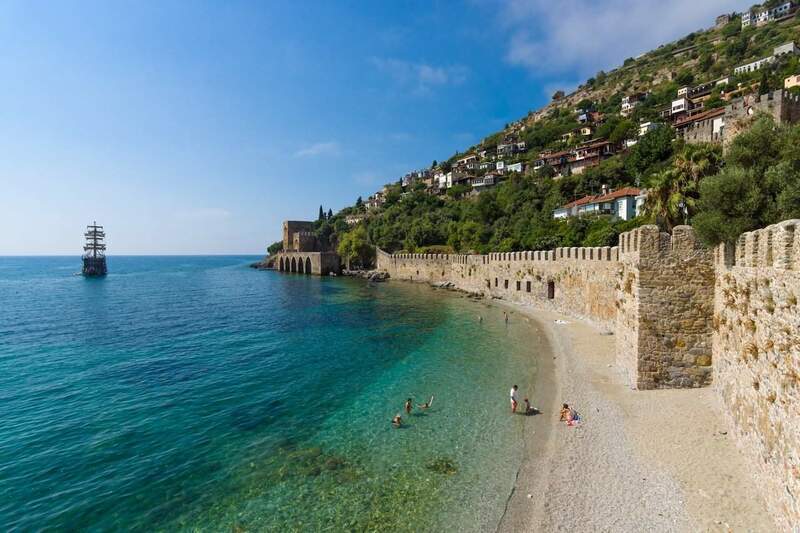 Take some time away from your gulet and relax on the beach at Kargili Bay, then make port at Kisebuku (Alakisla Buku) and explore the Byzantine monastery that now lies in dramatic ruins. Your final stop before returning to Bodrum is Yaliciftlik Bay where you can enjoy a fancy afternoon tea, before boarding your gulet one last time. Pick this route if you want to escape the tourist masses and explore secluded bays, islands and beaches. The cruise starts at Göcek, which lies at the head of the Gulf of Fethiye, around 22km from Dalaman Airport. 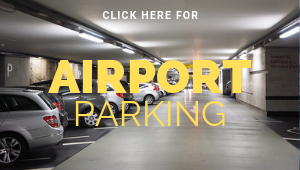 The island has a natural harbour and is also famous for Turgut Ozal Street, a long street offering luxury shops, international cuisine and live music. 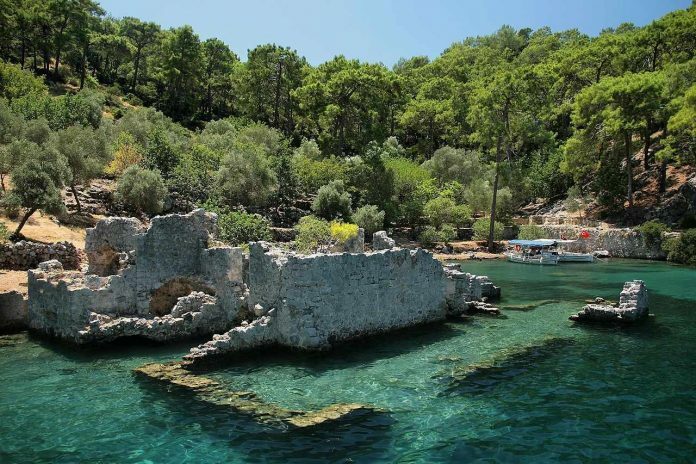 After setting sail from Göcek, you head to Cleopatra’s Bay (different to Cleopatra Island), so named because Cleopatra is rumoured to have bathed here. The bay contains some amazing underwater ruins which are accessible to divers. In the evening, enjoy a meal on board your gulet surrounded by the natural beauty of the island. For the next six days you will sail from island to island in the Gulf of Fethiye, exploring crumbling ruins, snorkelling in the turquoise Mediterranean, relaxing on quiet beaches and taking part in various watersport activities. The harbour at Tersane Island is ideal for young families who want to try out snorkelling. It is rumoured this was once a shipbuilding harbour so there are all sorts of treasures to discover. Fethiye, a mountainous island with a developed tourist infrastructure, is an ideal place to sample more extreme outdoor activities including paragliding and white-water rafting. 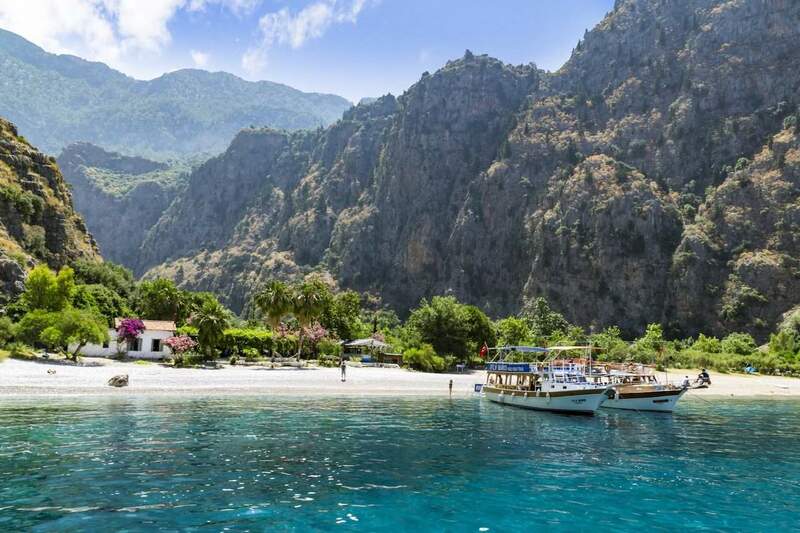 One of the highlights of this route is an overnight stay at Butterfly Valley in Fethiye, which is only accessibly by sea. During the summer months, the valley fills with butterflies, and some 105 species of butterfly have been recorded on the island. As a designated nature reserve, it has a really peaceful atmosphere and offers a welcome rest from the more active parts of the trip. 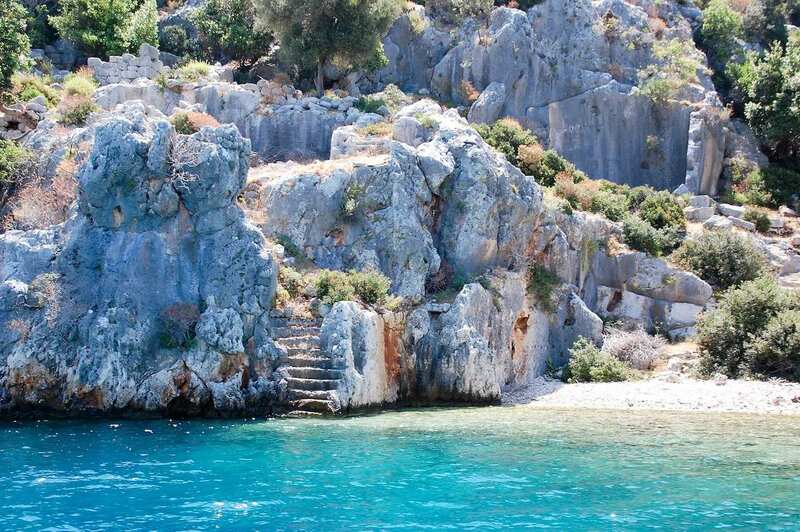 After your overnight stay at Butterfly Valley, your gulet will sail to the small village of Yeşilköy which contains some pretty wooden Art Nouveau houses, and then on to Kas. Here you will discover some interesting archaeological sites including an ancient amphitheatre overlooking the sea. You will also get the chance to go snorkelling or scuba diving while the crew is stocking up. Escape from the tourists and visit the protected island of Kekova, which remains unspoiled and uninhabited. Along the northern coast of the island are the partially submerged ruins of ancient town of Apollonia, which was destroyed by an earthquake in the 2nd century. On the final part of this trip you will sail around the uninhabited Yasica islands, which are covered with pine and olive trees. It has secluded beaches and well-sheltered bays and perfect for waters ports or to simply top up the tan. Turkey Luxury Gulets organise chartered gulet trips for 3-12 guests with a choice 21 luxury gulets. 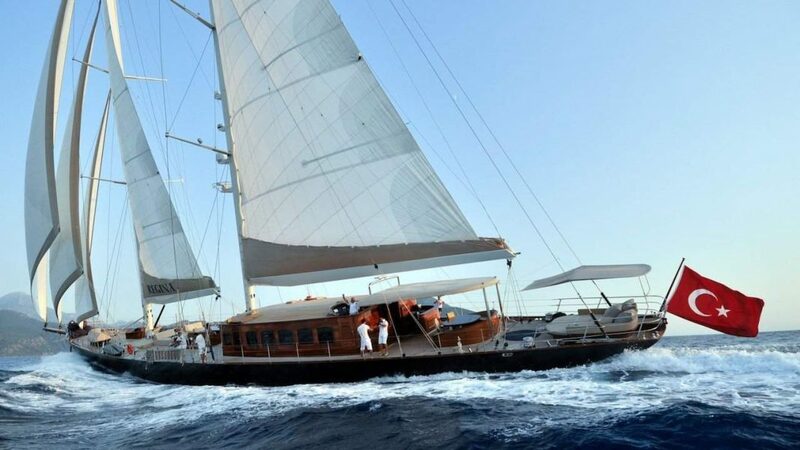 These range from the 24m Gulet Artemis & Simay (3 cabins) to the 56m Gulet Regina (6 cabins). Each gulet is designed to offer a luxurious experience with spacious, fully air conditioned rooms and private bathrooms. All gulets are equipped with WiFi, games and watersports equipment. The crew provide a high-end service and there is also a personal chef on board. The above routes are all sample itineraries. 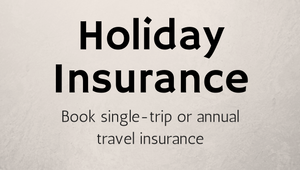 All trips are 100% tailor made and prices start from €14,000 per week. Disclaimer: this article was sponsored by Turkey Luxury Gulets. Previous articleOnima Restaurant – Mykonos in Mayfair?